Sometimes, even a great man of the church just wants to slip away unnoticed. There is a castle on a hill overlooking the houses of a Surrey town. It has belonged to the Bishops of Winchester forever and a day. And on one afternoon a week it is possible to tour the castle,where you will encounter a very interesting bookcase indeed. It sits on the first floor, directly opposite the Winchester Room which used to be the bishop’s room. And if you were to look behind the bookcase, you would find a winding staircase in golden stone. Hidden from the eyes of the world, it allows a bishop to disappear from view. The staircase emerges by a door to the outside world. Silently, one could flit away, far from the madding crowd. There are other reasons to build a secret chamber. It is possible that even today, some of them have not yet been discovered. Some places were built especially to hide people away from those who would arrest them and carry them to a castle to be tortured. And the mastermind who built them knew his trade so well that it is possible we have not unearthed every one yet. One man built them. A carpenter, little taller than a dwarf, created a network of safe houses across England at a time when tolerance was very far from being what it is today. He did it as close to cost as possible, and his unusal gifts gave him an uncanny knack of bending space to suit his own purposes. His name was Nicholas Owen; born in Oxford , died rather nastily at the Tower of London, he spent his life moving from great home to great home, building his hidden rooms. He operated during the reign of Elizabeth I. And at that time it seemed Catholics and Protestants would never get on. While Elizabeth has a firm-but-fair persona very different from her irascible father and highly-strung sister, a sectarian campaign still went on under her watch. Mass, the Catholic celebration, was illegal and priests were hunted out, often tortured and killed if found. Hence these tiny rooms. Often tiny spaces only just able to hold a person, a raid would force a priest inside, often without food and always without sanitation, for days sometimes. For the troops that came would knock on the door without warning and storm the house. They would look at the footprint of the house from the outside and compare it to the inside, and then count the windows, knock on the walls to listen for hollow spaces and tear up floorboards. They did arrest him in 1594, and took him to the Tower of London for torture; but the stout carpenter withstood everything they could do to him and was released, only to help someone escape from the Tower shortly afterwards. Events were bound to catch up with him eventually. They did so at Hindlip, Worcestershire, in the freezing January of 1606. Owen and another were holed up for four days in a space in the Long Gallery with only an apple between them. An official report of the day states that ‘eleven secret corners and conveyances were found in the said house’. It was from there to Marshalsea, and thence to the Tower, where torture and death awaited him. In my town is an old manor house, and to this day one can see the priest hole above the fireplace if one asks the local publican. I wonder if it is one of Nicholas Owen’s? I used the Oxford National Dictionary of Biography entry on Nicholas owen to write this post, which was written in response to Side View’s weekend theme, Hiding something, which you can find here. Posted in Quirks of HistoryTagged hidey holes, priest holes, priets, secret passages, secret rooms, secret staircasesBookmark the permalink. This is very coincidental, Kate. I am designing the book that my sister has written on our family’s history. We have been a Catholic family as far back as we have traced. Part of the book relates to family who lived in Baddesley Clinton. As for Harvington Hall – I went to prep school in Chaddesley Corbett and we walked, in a crocodile, to Mass in the old church opposite Harvington Hall. Amazing coincidence indeed, Roger! I’d love to read that book when its ready! The provenance of the modern panic-room, no doubt. I had never heard of these before your comment, BB! There is something very unsettling about a safe room which might turn into an unsafe room. As it did for some of the priests, I fear. Strange, isn’t it, Elspeth: we have had our own troubled times. It would have been nice, Madhu; but I think he diced with death right the way through his career. He had far more than nine lives. Horrid business, really. I have always loved secret rooms and passages! That probably led to my fondness for cave exploration. Never had the pleasure of ‘doing’ any in UK. Would love to, though. I think you’d enjoy these! You would enjoy the Winchester House in San Jose, California with its many mystery rooms. Hey Lou, I visited that house about 45 years ago when I was a kid. It freaked me out. One National Trust house I’ve always wanted to visit is Chastleton House in Oxfordshire, where there is a secret chamber off the main bedroom where the owner hid from Roundhead soldiers. Probably a little too late for Master Owen’s handiwork as the House was rebuilt after the Gunpowder Plot. One day, perhaps, I’ll get there. These secret chambers are the stuff of mysteries, thrillers and historical fiction, even dreams, aren’t they. The fascination with them must speak of some deep atavistic meme. i have never been to Chastleton, Chris, and now I must. A room to hide a Cavalier? They are wonderful puzzles, to which we’ll never have the full story, I fear. Rather ironic that Nicholas built secret rooms for hiding but was “found” and dragged to the tower just the same. Secret rooms and gardens hold endless fascination. Thanks, Kate. I think the more Nicholas did this, the more likely it was that he would one day be apprehended, Nancy. He upped the odds with his tireless, infailing work. they are fascinating, these rooms, aren’t they? Magic – wonder if I could fit something in to our new house. I’ve always loved the idea of bookcases that are really doors. One of my Dad’s cousins has hidden a staircase behind a door and it’s fab! Perhaps something could be arranged in my study … !! Fascinating piece of history about a hero during intolerant times Kate. Any chance your local publican would let you take a picture of that priest hole above the fireplace? I am almost sure he would, Lame. Leave it with me, I’ll see what I can do. I wonder if there are any secret rooms in New York? I love the idea of a secret room, Kate… but not so much the priest holes. I get an eerie feeling whenever I see the term! However, I have a recurring dream where I’m in a house and find a secret stairway (usually hidden behind heavy curtains, or inside a cupboard somewhere), climb it, and find a whole hidden floor that isn’t visible from the outside! Nicholas Owen sounds like an interesting chap. A whole secret floor! You remind me of Anne Frank, Tom. She and her family and others survived for around three years and no-one adked any questions. Amazing place, have you been there? Nicholas Owen’s holes were life savers. Those were, indeed, intolerant times. Sometimes, it seems those times are not all that far off. Thank you for this bit of history, Kate. Judy, you are right there: intolerance has dogged the human race. I was just talking with Tom about the secret apartments in which Anne Frank lived. Chilliing that they were even required, let alone used for so long. MTM once had an architecture client in Chicago request a secret room for his house. The mystery and intrigue swirled around the space. The client would give few details about it, other than the size he wanted. No windows. One door. Soundproof. It creeped MTM out so much that he almost quit the project. eww…that just took a bit of the mystical fantasy out of my love for these little spaces. It makes me think “Devil in the White City” circa 21st century! Oooh, that is dark. Horrid business. You remind me of Austria’s Josef Fritzl. Strange how enticing these little places can be, Angela. The idea of a place all our own where the world cannot interfere is a compelling one indeed. I’ve always been fascinated with secret rooms and hidden passages, Kate. Never heard them called priest holes before, but, of course that makes sense, much like the myriad of caves in places like Turkey, the Asia Minor of early Christianity. A girl who lived on our floor in college lived in a house that was used by the Underground Railroad and had hidden spaces. She told stories of the dog going downstairs and disappearing for days at a time, only to return out of nowhere. We all went to her wedding, in part to see the house. How amazing! Is that the safe house system used by slaves during the Civil War, Penny? I would love to hear what you found when you visited for the wedding! Yes, it was a safe house during the Civil War and even before. The Underground Railroad was a system/route slaves would follow in their escape. Houses like this would have a marking of some sort for shelter and safety and they would have secret rooms for hiding. There is a grist mill not far from the Cutoff that was a stop on the Underground Railroad. The house was quite interesting; old, with lots of additions and steps where steps ought not have been. I’m afraid we spent more time trying to figure out where the hiding place was than we did admiring the bride. The house still sits along a major road. Her parents were professors at a nearby college and they would often have gatherings for students at this house. To this day, a mention of the name of profs leads to a discussion on the house. One of my favorite books growing up was The Velvet Room – a secret place where a young reader would steal away to. It was delicious. Just this weekend I told my husband to dig a secret cellar for us! 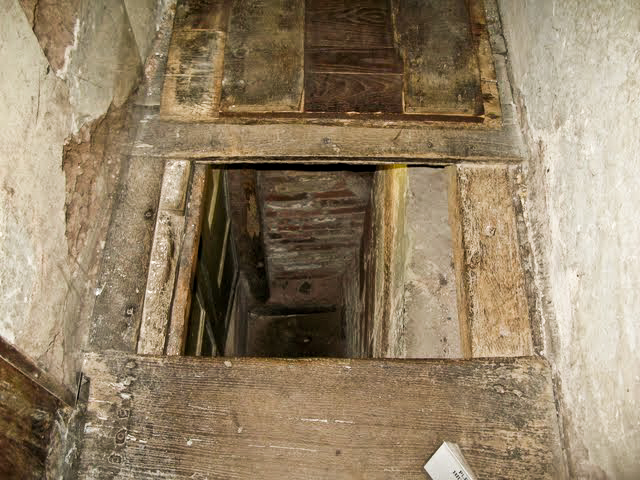 I’m fascinated by how many old places in England have priest holes. Elizabeth wasn’t kidding around with wanting to get rid of them. I never heard of Nicholas Owen, so thank you for sharing his story. Brave fella, he was. I’m glad Lou shared about the Winchester House…I haven’t been there in years, but it might be time to visit again. But I really would love to see the rooms you’re describing. What an amazing man, Nicholas Owen, and it’s shocking to hear that after all those years of helping others escape he met his own fate in the Tower. The idea that the holes were needed in the first place still shocks me, but history has its ugly truths–everywhere! I love this history lesson, Kate!